The Pagani Huayra Carbon edition has been a guest in the stand GoPro at the aftermarket Motor Show held in Las Vegas. This is not the first time that SEMA held a Pagani, a Pagani Zonda R was showcased at the SEMA Show in 2009, at the 2005 and 2006 editions a rare red Zonda S 7.0 was held by NITTO stand and in 2006 a red Zonda S Roadster was held by Michelin stand together with other beautiful supercars. 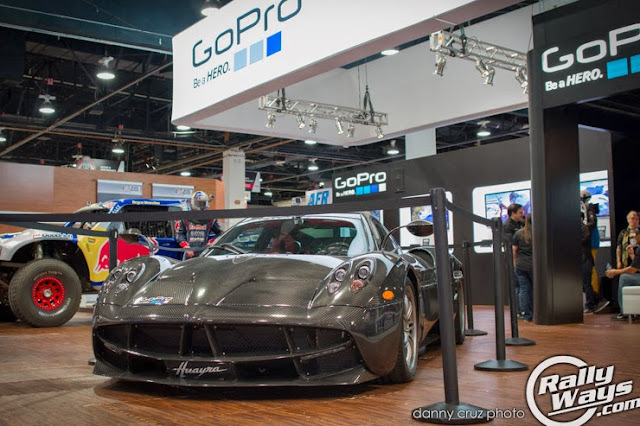 This naked carbon fiber Pagani Huayra Carbon Edition can be seen at the GoPro stand and it is for sure the star of the show.